Felix immediately perceived that there was no case against Paul. The only count in the indictment with any truth to it was the one naming Paul “a ringleader of the sect of the Nazarenes.” The procurator knew that the Christian movement had not been declared an illegal religion by the Romans. Therefore, he had no right to force Paul to justify himself for having embraced the Christian faith or to explain its doctrines. When Paul gave his rebuttal to the charges against him his main point was that the only issue between him and his accusers was a theological one that should never have come to this court. The governor (Felix) may well have agreed with him on this point but the case had come to court and for various reasons he was unwilling to give an early verdict. Instead he simply adjourned the case. One reason for delaying the verdict appears later in verse 26, but here Luke mentions that Felix had “more perfect knowledge of that way”; that is to say, “He had complete and accurate knowledge of the facts about the Way”: somewhere, somehow, Felix (means “happy”) had acquired accurate knowledge about Christianity. This statement gives the impression that he was sympathetic toward the Christians—or at least had no desire to see them treated unjustly by the Jews—without wanting, to offend the Jews by setting Paul free. In any event it shows that this Roman, with a good grasp of the facts, found himself unable to condemn the apostle, and he didn’t want to pass a verdict, for the verdict would surely have been one of acquittal. Felix then, knew the facts about Christianity and Jesus, but it is not enough for a person to know the facts about Christ, or to have an emotional response to a message. He or she must willingly repent of sin and trust the Savior. “But you are not willing to come to Me that you may have life” (John 5:40; NKJV). 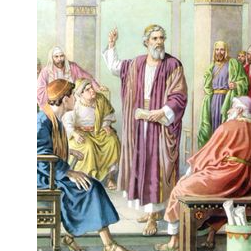 Moreover, Paul’s testimony rang true. Felix had no illusions about Ananias and his crowd. He knew what a scoundrel Ananias was. He had no trouble deciding Paul was innocent of the charges leveled against him. However, he had no intention of stirring up the powerful Sanhedrin against himself. He took the easy way out. He deferred the case until such time as he could bring down the tribune for a firsthand report. That sounded all right, but in reality it was a cowardly compromise. Paul calmly accepted Felix’s decision simply because he had no other options open to him in this court, all he could do is wait and hope for release. He remained a prisoner, though he was granted the privilege of what the Romans called “free custody” as befitting his status of Roman citizen. This meant that his friends could visit him and tend to his needs. When Felix instructs a centurion“to let him have liberty, and that he should forbid none of his acquaintance to minister or come unto him,” he is addressing a problem within their prisons at that time. Ancient prisons were places where accused people were held for trial, at which time they were released, executed, punished by fine, had their property confiscated, or received corporal punishment. Imprisonment was not itself a means of punishment for condemned criminals. Thus there were no provisions for feeding and caring for prisoners on a long-term basis, and it was important for friends of those accused to have access to them. This access could be granted or denied. Paul is pictured as being treated favorably by Rome, as the facts will show.